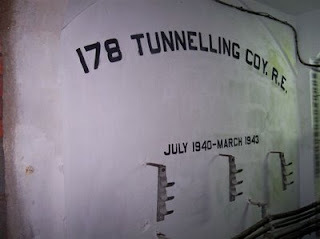 The above photograph shows the mark left by 178 Tunnelling Co, R.E. who had excavated this section of the tunnel between July 1940 and March 1943. With the fall of France in June 1940, it was felt there was a strong possibility that Spain may enter the war on the Axis side. At that time Gibraltar was a key strategic location at the entrance to the Mediterranean, and an important staging post for Allied ships on the way to Malta, the Middle East, Suez and the Far East. So additional tunnelling inside the Rock began, although by the work was completed in 1943 any potential threat of siege had long since passed. 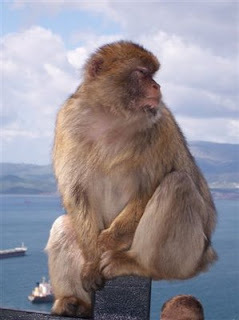 In 2008 I took the above photograph of one of the Barbary Apes of Gibraltar during a visit to the ‘Rock’. A local tradition has always said that Gibraltar would remain British while the Barbary Apes (actually tailless monkeys) remained on the Rock. During WW2 Gibraltar was in a key strategic location, effectively enabling Britain and its Allies to control the entrance to the Mediterranean Sea from the Atlantic via the Straits of Gibraltar. It was a key staging post on the supply route to the Malta, Suez and the Middle East and was an important base in 1942 for the Allied invasion of North Africa.